Many email programs will only need your email address and password and can take care of the rest automatically. IMAP is the preferred standard used by the email program for incoming email. IMAP allows for a smooth experience accessing your mail and keeping your email consistent across multiple devices. POP is another standard used by the email program for incoming email. POP allows you to store copies of your emails on your device for offline use, When setting up a program, you would use the value "pop.example.com". SMTP is used by the email program for outgoing email. Emails from specific senders are causing my email program to crash. Why might this be happening? If you are using Microsoft Outlook, there are many reasons Outlook could be crashing on specific emails only. If Microsoft Outlook is crashing consistently, you might want to contact Microsoft Support to see if they can provide information as to why it's crashing. It's likely there could be a bug in the version of Outlook you are using and they might have an update available, especially if you are using an older version of Outlook. They might require that you forward them the email that is crashing outlook. If you need to open the email to forward it you can use the Webmail account set up for your website. In addition to Microsoft Outlook, there are additional email programs available for use. As an example, we use Mozilla Thunderbird here in the LunaSoft office. 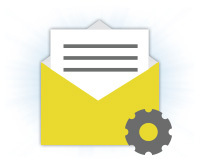 How do I change the email address that receives emails after someone registers on my website? After someone registers themselves as a user on your website, a notification email will be sent to the "site email". This can be edited within Settings (the last item in the black navigation bar in your website's admin interface). Is there a way to do “out-of-office” notifications with Lunasoft email? Yes, with our webmail program, you can set those kinds of messages, also commonly referred to as "autoresponder" or "vacation messages". After logging in to your website's webmail, go to Settings (gear icon in upper right corner), and then click "Vacation Message". If you plan on using a third party program to set this up, we recommend searching that program's support section on how to set that up. How do I change my email signature? If you need help adjusting your email signature for a third party email program, please see the appropriate link at the beginning of this page. Within our webmail program, you can adjust your html signature by clicking on Settings > Identities, and then clicking on your Identity. Why am I not able to send emails and getting a "451: you have exceeded your messaging limits" error message? Your account is likely being used by another program to send a large amount of emails without your knowing it. The first thing you will want to do is change your password. Then, you will need to scan all devices that you are using to send emails for malware.